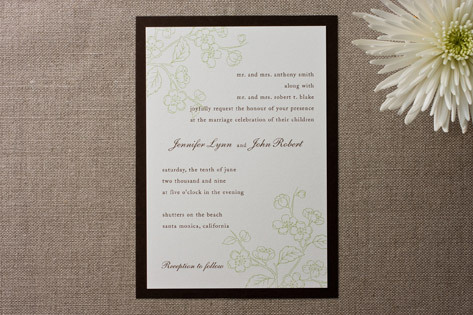 Earth tones and delicate floral illustrations meld with beautiful typography in this sophisticated, understated wedding invitation. Framed with a darker border to add contrast, this suite is a wonderful choice for an elegant occasion. Available in sage/brown, lavender/dark green, sky/navy, and aqua/brown.